Please note that the content of this book primarily consists of articles available from Wikipedia or other free sources online. 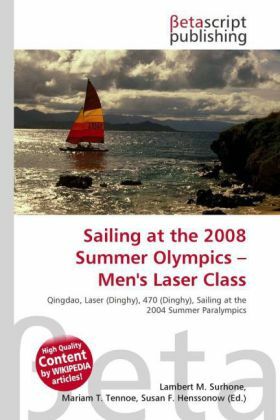 Men''s Laser class competition at the 2008 Summer Olympics in Beijing took place from August 12 to 19 in Qingdao, at the Qingdao International Marina. 43 sailors competed in this Laser dinghy competition. Points were assigned based on the finishing position in each race (1 for first, 2 for second, etc.). The points were totaled from the top 9 results of the first 10 races, with lower totals being better. If a sailor was disqualified or did not complete the race, 44 points were assigned for that race (as there were 43 sailors in this competition). The top 10 sailors at that point competed in the final race, with placings counting double for final score. The sailor with the lowest total score won.